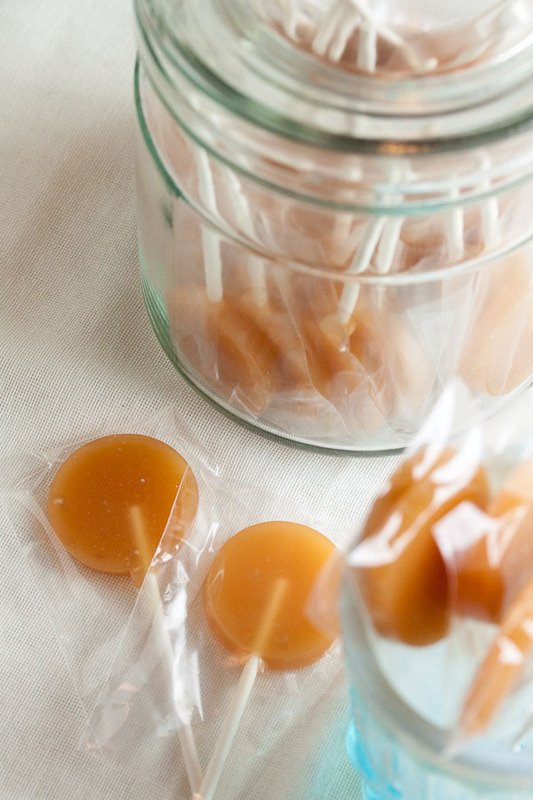 Old-Fashioned Butterscotch Lollipops | wanna come with? I’m a fan of butterscotch, and every time I bring butterscotch cookies to work, or anything with butterscotch chips in it, I realize that a lot of my coworkers are fans too. But when I think of butterscotch – true butterscotch – I think of butterscotch pudding my mom made when I was a kid, or those old hard candies that your grandma maybe had in a bowl on her coffee table – it’s an old-fashioned flavour, right? But it’s delicious! It should be more popular! 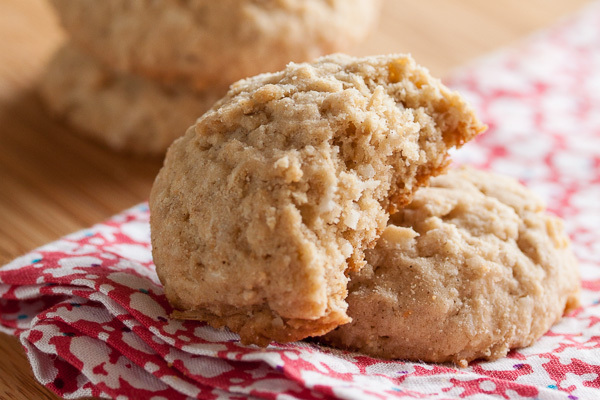 I’ve mentioned it before, but I’m making it my mission – I’m seeking out and making every butterscotch cookie recipe I can find. And apparently candy, too. We’re bringing butterscotch back. I started looking into what a “traditional” butterscotch recipe would include. One site insists that true butterscotch should include nothing but sugar, butter, molasses, and vinegar. According to Wikipedia, it’s typically made with brown sugar and butter, but the earliest found recipe contained just sugar, butter, and treacle. Long story short, the recipes I found varied pretty wildly. What does that mean? It means I’m just going to have to try a variety of them. Ah well, the things I do. I’m starting with a recipe that contains white sugar, corn syrup (to help prevent crystallization), butter, and vinegar. Why start here? Why not. I’m really not too sure why so many recipes include vinegar – the Wikipedia article makes no mention of it – but it’s a common ingredient in a lot of the recipes I came across. According to one site, it causes a chemical reaction which helps the butterscotch to soften when it warms in your mouth, but I found another that claims it helps prevent the sugar from recrystallizing, while others say that it’s simply a flavour enhancer. If anyone has any insight, please chime in! I’d love to hear what you think. I’m not usually a fan of hard candies (I’m generally not crazy about really sugary things in general), but I always have to try what I make each week. And surprisingly, I really enjoyed this candy. Yes, it’s sweet, but the caramelization tones that down a bit (caramels are one of the few candies that I really like). And it definitely tastes like butterscotch. Yay! Success! If you’re pouring the butterscotch into moulds, work quickly as it doesn’t take long to set up. I barely got done in time – in fact by the time I got to the last one, it was almost too thick to pour. 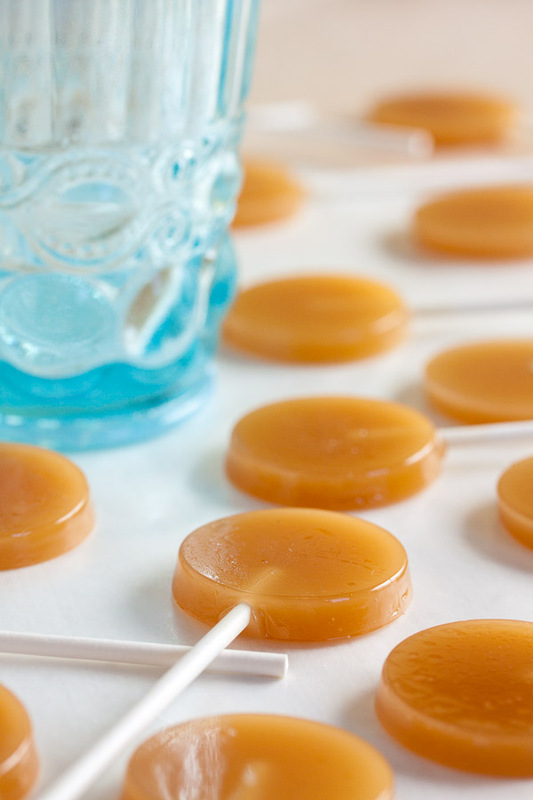 Adapted from "Old-Fashioned Butterscotch" from Better Homes & Gardens. Makes 32 small lollipops. I used this mould, but look at this cute one! Jealous. I kinda wish I had that one. 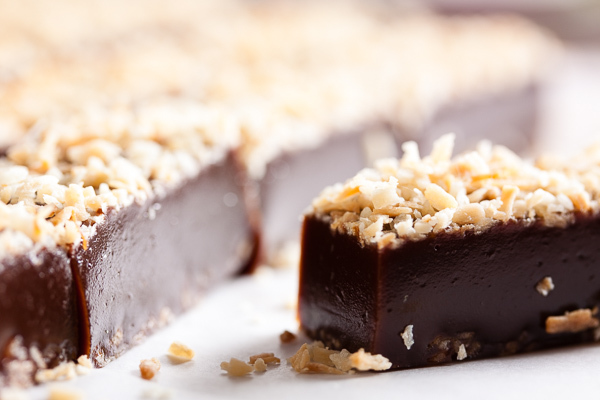 Whatever you use, be sure it's made for hard candy, not candy melts. 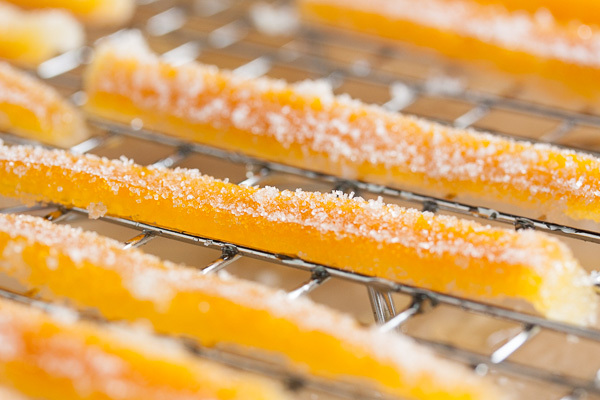 These are made specially to deal with the high temperature of melted sugar. If you don't have moulds, read on – there are instructions in the recipe for making them without moulds. Note: when cooking sugar, subtract 2°F from the target temperature for every 1000 ft above sea level. Spray your moulds with cooking spray (or your lined pan, if you're not using moulds), and place your lollipop sticks in the moulds. Choose a heavy-weight saucepan to cook your sugar in – deep is better than wide so your thermometer will be covered by enough volume to register an accurate temperature (most digital thermometers have a guideline indicating minimum depth). Combine the sugar, corn syrup, water, and vinegar in the saucepan and heat over medium-high heat until the sugar has melted. Do not stir the sugar at this point. Stirring may cause recrystallization. Instead, just gently swirl the pan a few times. Continue cooking over medium-high heat until it reaches a boil. Using a pastry brush and some cold water, brush down the sides of the pot to ensure any sugar crystals that may be clinging to the edge are melted. Alternately, you could put the lid on the pot and let it boil for a couple minutes covered – the steam that builds up under the lid will also melt away the sugar crystals. Add your thermometer to your saucepan. Continue to cook the sugar while gradually adding the butter, a couple pieces at a time, stirring frequently. Continue to cook, stirring frequently, until your thermometer reads 300°F. I find it easier to control the pour of the candy by transferring the liquid from my saucepan to a heat-proof container with a pour spout. If you have a fancy saucepan with a pour spout, you can use that. I use a milk steaming pitcher. Some people recommend using pyrex measuring cups, but I've heard horror stories about the newer ones shattering when the temperature shifts suddenly (like pouring a really hot liquid into it). I was too nervous to try it with mine. You need to work quickly as this mixture will set up pretty quickly. Gently pour your sugar mixture into the moulds. Your lollipop sticks may get shifted around a bit – just gently push them back into position. Be careful not to touch the hot sugar – it's extremely hot and can cause severe burns. 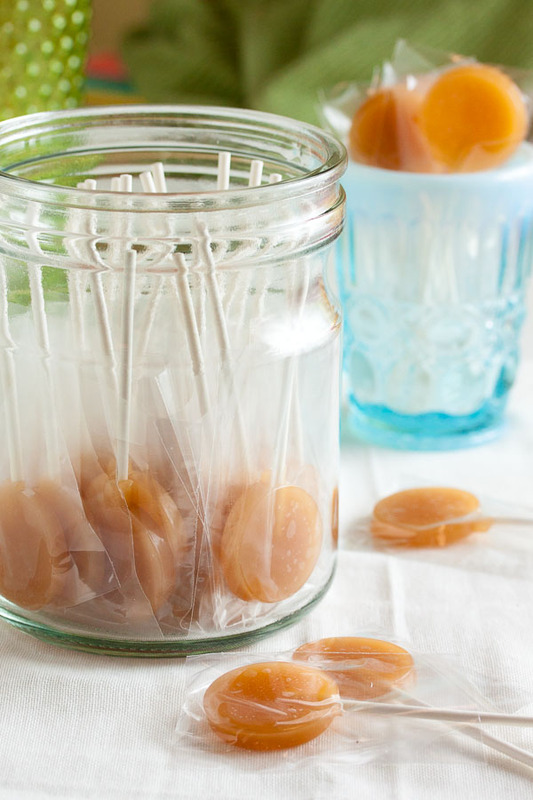 You don't actually need moulds to make lollipops. 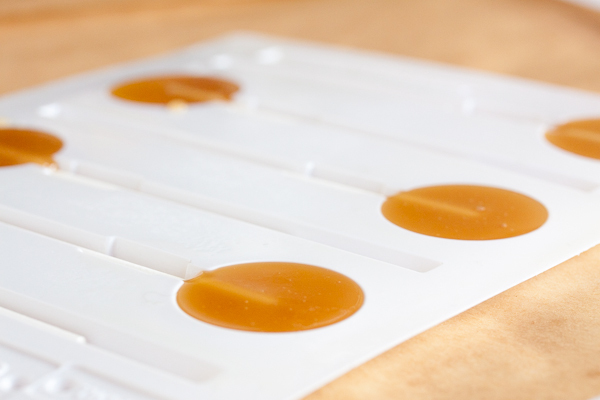 You can lightly oil a piece of parchment paper and pour your butterscotch onto the sheet to form small circles. Immediately drop a lollipop stick onto each one. Note that lollipops made this way tend to be thinner than ones made in moulds, and may have sharper edges. Once the lollipops have set, you can remove them from the moulds and wrap them in cellophane. I found these pretzel bags – once I cut the length down, they were the perfect size for my lollipops. You don't even have to make lollipops out of this recipe. You can pour the mixture into a pan lined with oiled parchment paper. Let it sit for 5-10 minutes, until it's partially set and there's a film on the top, and then gently score it with a butter knife or spatula (be careful not to break this film). You can continue to score it as it cools, gently deepening the grooves each time. Once the mixture hardens completely, you can break it along those lines to make small candies. Thanks Stephanie! That was a great article – I love learning how recipes came to be. What is the UK equivalent of corn syrup? Love butterscotch. Until last year my favourite was butterscotch gums. Little rectangular squishy golden sweets. Alas they are not made any more, reason – not popular enough! 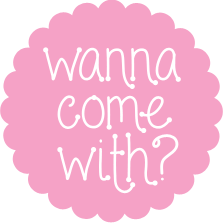 Would like to make more sweets, but not confident enough. Thank you for this recipe – I remember such delights from my childhood. And thanks too, to Stephanie for the article. It was fascinating.